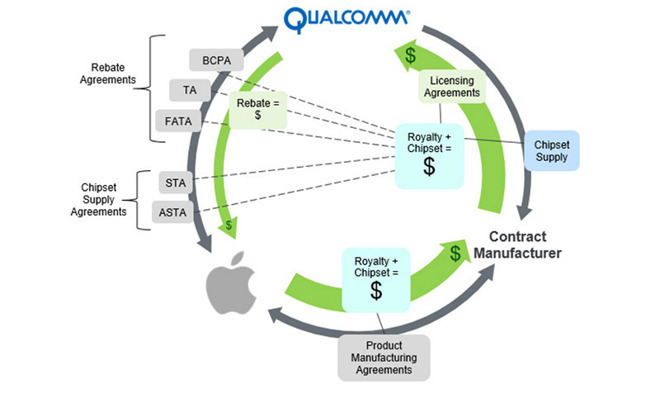 Graphic from Apple lawsuit detailing Qualcomm's alleged nefarious licensing practices. "While we are still in the process of reviewing the complaint in detail, it is quite clear that Apple's claims are baseless," Qualcomm executive VP and general counsel Don Rosenberg said in a press release. "Apple has intentionally mischaracterized our agreements and negotiations, as well as the enormity and value of the technology we have invented, contributed and shared with all mobile device makers through our licensing program." Apple has been "actively encouraging" investigations by the likes of the U.S. Federal Trade Commission and the Korean Fair Trade Commission, Rosenberg suggested, "by misrepresenting facts and withholding information." In late December, the KFTC concluded its investigation by issuing the company a $853 million fine, accusing it not only of bundling chip orders and licensing deals but being too restrictive with licensing in general, while simultaneously avoiding payments for patents held by others. "We welcome the opportunity to have these meritless claims heard in court where we will be entitled to full discovery of Apple's practices and a robust examination of the merits," Rosenberg concluded. On filing its lawsuit on Friday, Apple accused Qualcomm of exploiting its "monopoly power" to dodge FRAND (fair, reasonable and nondiscriminatory) patent commitments, for instance charging "extortion-level" rates for standards-essential patents. Above all, it suggested that Qualcomm withheld rebates as retaliation for it cooperating with enforcement agencies, and even tried to get Apple to lie to the KFTC in exchange for releasing money. Both Apple and the FTC have claimed that Qualcomm forced Apple into an exclusive chip supply deal between 2011 and 2016, making that the condition of rebates. The iPhone 7, released last September, is Apple's first iPhone model to use two LTE modem suppliers, the second being Intel.